I had a lovely post about my Rogue here. Let's see if I can recreate it. Otherwise the keyboard might be getting the bamboo under the spacebar torture treatment. As I was saying before I was so rudely interrupted by burping internets, I'm a follower. And the next project for this lemming is Rogue. Yes, I know it's a year late. I've been loving it for awhile, but I really need a cardigan for a Floriday style winter "coat". And steeking really skeered me. But then I found the cardiganizing directions. And there were no excuses left for ole Corrina. Except the yarn excuse. I had been looking at yarns for awhile and couldn't decide. But then I went into my LYS and found this. Cascade 220 in color 8013, Walnut Heather. And just enough skeins to make my sweater. It was fate. Fate, I tell you. 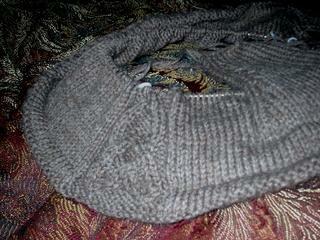 I did the ribbed hem instead of the twisted. I didn't want to deal with the bias in an open front sweater. I only did four rows as well. I thought the 12 row hems were overkill. I knitted the hem right up into my sweater. I did do a turning row. 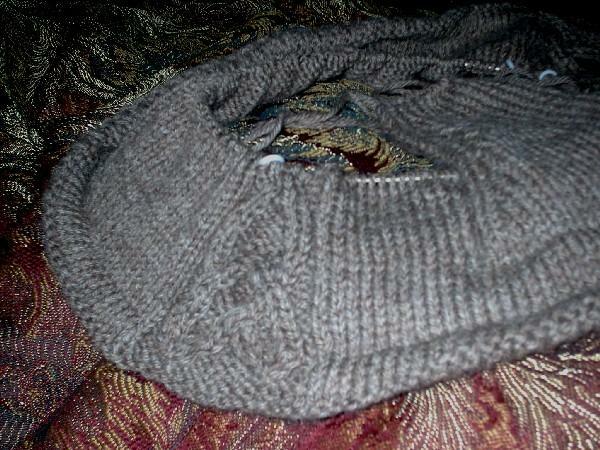 I think the purl bumps make a nice finished bottom. The cables are not super hard, but the increases used to begin the closed loop cables were a little tricky. But I figured it out. I realize it's still in the high 80's here. But soon, soon I tell you, the temperature will begin to drop. And if it goes under 60 (gasp!) I will have my Rogue at the ready. Of course all the other thin-blooded folk around here will be in down coats, hats, mittens, and scarfs at the sign of sub-60 temps, but we just laugh at those people. Laugh at those people in my stylish lemming sweater.